I love road trips. I like the sense of freedom it gives me because, although I usually have a pretty set schedule, it makes me feel like I can go where I want when I want. I also love that I can take both Chester and Gretel with me. They love riding in the car and I love looking over to see them sleeping or looking out of the window. I also like road trips because I am cheap. Well, at least I try to be. Gas costs as much or more than a plane ticket these days. However, I am mobile so I can save money on hotels by driving a bit out of my way for campsites. We do stay in dog friendly hotels or hostels sometimes but saving money by sleeping in the car means we have more money to spend on experiences. Another way taking a road trip with the dogs saves money is that we can bring food with us instead of eating out all of the time. It can be a challenge though. Chester in particular is a magician when it comes to opening bags and containers in the car. Well, ok, I might not call it magic – he chews through the zipper or on the Tupperware lid – but there isn’t much he can’t get into. 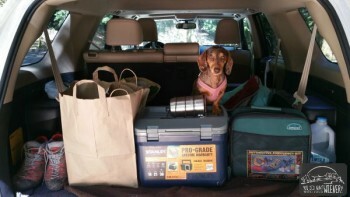 We needed a cooler that was Chester proof to bring with us on our trip to Colorado. 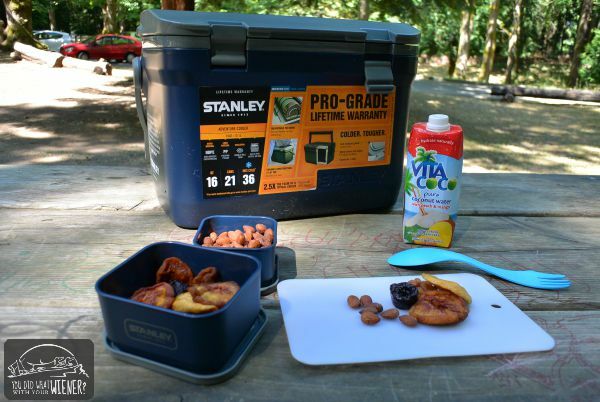 I go the opportunity to check out the Stanley Brand 16qt. Adventure Cooler and it was perfect for us. First, the cooler locks closed with two clips. They are very sturdy and clip tight so Chester won’t be able to nose them open. It also has a seal around the lid that will help keep enticing smells in and help prevent leaks if Chester knocks it over trying to get inside. It’s big enough to hold a day or so worth of road snacks but small enough to not be cumbersome when space is at a premium. Also, the extra thick insulation will help to make our ice last longer in the heat. Some of those things don’t have to stay on ice but we stillkeep them in the cooler so Chester doesn’t eat them. I seal some things inside the Stanley Brand nesting food containers I already had to keep the melting cooler ice from making them soggy. We also save money by skipping Starbucks and making our own coffee in the morning. We bring along Starbucks Via packets and milk for lattes. I also bring some chocolate sauce to make a mocha. If we are at a hotel, we usually have access to hot water. We need a way to heat our own when we are camping though. 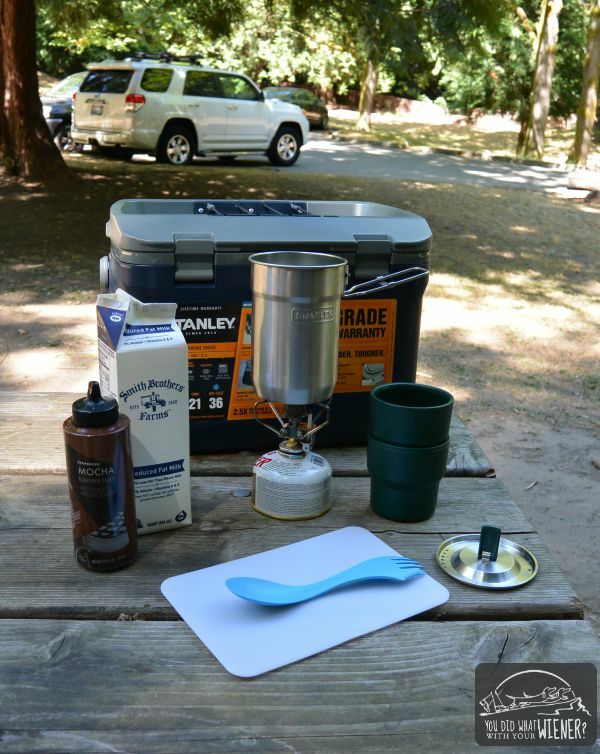 Along with the cooler, we also got to try the Stanley Brand Adventure Camp Cookset. The 24 oz. stainless steel pot is the perfect size for two morning coffees. The two 10 oz. insulated plastic cups that nest inside are super handy because they save space and allow me to enjoy my coffee without burning my fingers. We have almost everything packed to leave on our road trip next week but have been tweaking some things to make this summer adventure more enjoyable… and future adventures too. The Stanley cooler is not only perfect to keep Chester out of our road snacks but will be good for keeping cold drinks on the shore while we are out paddleboarding. In addition to making coffee on the road, the pot will be handy on my multi-day backpacking trip with Gretel or for coffee and oatmeal. You can get the cooler and cookset for your own summer adventures, along with a lot of other great Stanley Brand products, on the REI website. Sounds like you have a great system for road tripping. We have a day trip with the dogs coming up and I always take my own car snacks. Safe travels. We’re certainly getting a system down. We’ve been getting better about bringing food with us so we aren’t stopping for fast food all of the time. Have fun on your excursion. We are going on a road trip next week too! We’re taking Wynston and Khloee to our vacation home in California. It’s not too long of a drive (about 6 hours) but we always bring a cooler with snacks for the road and we pack things for the house. We don’t have food at the house since we just visit from time to time, so we bring food to eat there so we don’t have to eat out much! Have a blast on your road trip and be safe! I saw that you guys were going to be at the beach! How fun. Bringing food is key, at least for us. because we end up eating so unhealthy when we travel otherwise. Have a good time. You obviously are a very experienced traveler. The Stanely Cooler looks promising. I also prefer to bring my own food, which is not only cheaper but also healthier than most of what you find while traveling. Yeah, I’ve been on a few road trips over the years and definitely have a system. I’m just find-tuning it now. My first road trip was 1-month long, by myself, and I drove from Seattle to Amarillo, TX visiting a lot of places in between. I love hitting the road to explore new places. This will be my first time to Colorado since that trip. The healthy thing is the other main reason we bring snacks. Not only is eating out expensive, but most of the stuff is not good for you either. I absolutely love that coconut water, but, boy oh boy, it is expensive in my area! I only treat myself when it goes on sale. We don’t take road trips with Dakota, but your most thorough, informative, interesting and fabulous suggestions/review, sure makes me wish that we did! Mom packs some food and we always have a cooler along, but we aren’t into cooking on the road, so if it can’t be made ahead and eaten cold, forget it but we do save some money with our plan too. Not into the fancy expensive food stops. I love reading about other people’s road trips. We are heading out on one soon. I wish it were out west, but this time around we are going to stay on the east coast. Happy traveling! Thank you for this blog. Just stumbled onto it today after trying to figure out how long a hike my Charlie (dauchshund papillion, sheltie mix) can do after getting lost on a trail today and seeing him a bit tired. (I carried him out just in case once he started to walk behind me). Love the gear recommendation (saw that it sponsored you) because although I don’t camp and do hotels or day trips in CA mostly I do find my food getting soggy so love this solution. Thanks for a great blog. We’ll be following your travels.